St. Andrew’s believes that schools play a significant role in the development of healthy communities and individuals. For this reason, we have partnered with Whittier Elementary School, which serves the mostly Hispanic community of west-side Costa Mesa. Students who live in Spanish-speaking environments struggle to develop their English-language skills, putting them at a disadvantage in their academic studies and professional pursuits. By investing our time and energy, we believe Whittier students will be given the best chance to reach their full potential. 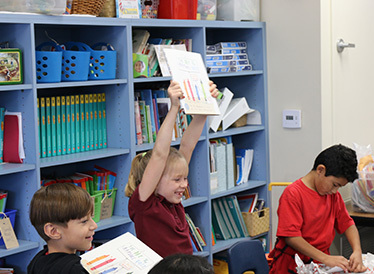 Our specific goal is to help every third grader read at grade level. To accomplish this goal, we are investing in the following areas: literacy, staff encouragement, parental engagement, and facility improvement. As a volunteer, you may listen to students read, help kindergarteners learn their ABC’s, assist in the library, or volunteer in a classroom on a weekly basis. There are also one-time volunteer opportunities – read to a classroom during “Read Across America,” or help with the annual “Whittier Picnic and Book Give Away,” which is an excellent opportunity for families to serve together. Prayer Focus: Thank God for the opportunity to walk alongside the staff, students, and families of Whittier Elementary School. May the fruits of the St. Andrew’s volunteers bless the students and teachers practically, as well as draw them closer to You. Pray that we would have softened hearts as we learn to love and invest in our neighbors as Your champions of economic, racial and spiritual reconciliation. Show love to our neighbors in Costa Mesa by reading to students at Whittier Elementary during Dr. Seuss Day on the morning of March 1. Help us build relationships and show Christ’s love by helping students to reach their full potential! Email whittier@sapres.org to sign up!